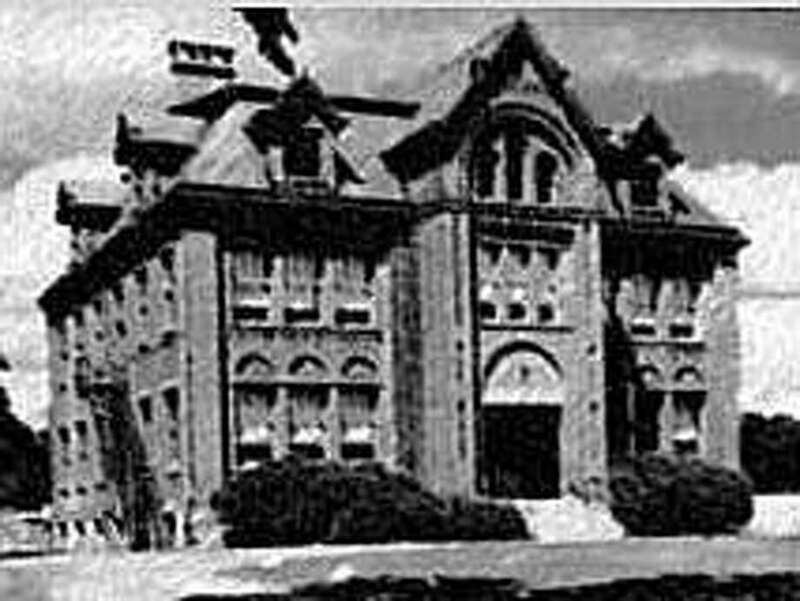 The original Horace Staples High School on Riverside Avenue, dating to 1884. Last Thursday was Horace Staples’ birthday. If he were still alive, he would be 218 years old. He didn’t make it that far, of course. But he led a long and fruitful life nonetheless. When Horace Staples died of pneumonia on March 6, 1897, he was 96. He had outlived his wives and children. He was the oldest and best-known citizen in town. More than a decade earlier, he had established Westport’s high school. His name and legacy live on, 135 years later. But as Staples High School celebrated Founder’s Day last week — with exhibits, speakers and “Horace Staples” (yours truly, dressed in long coat and top hat) roaming the halls — it was a good time to ask: Who was that guy? Quite an interesting character, it turns out. Horace was a direct descendant of Thomas Staples, one of five settlers who founded Fairfield in 1639. Another ancestor — Mary Staples — was acquitted of witchcraft during the fever of 1692. Horace Staples began working at age 8. At 27, he started a lumber and hardware business in Saugatuck. It soon grew into a general store carrying grain, groceries, household furnishings and medicines. He bought sailing vessels, a silk factory and an axe factory. He owned a thriving pier off the west bank of the Saugatuck River, near the State Street (now Post Road) bridge. In 1852 he helped establish a bank. Somehow, he found time to run a farm. During the Civil War, Staples watched in dismay as Westport boys and girls boarded the State Street trolley. Some headed west to Norwalk, others east to Bridgeport — the nearest towns with high schools. It was time, he thought, for his village to “get up” a high school of its own. He offered to give Westport a lot for a building, but no one did anything. He offered again, but again the town failed to act. Year after year, young Westporters went elsewhere for their education. Others, at age 14, began to work. In 1880 Staples’ only daughter, Mary Elizabeth, died. His sole remaining heir was a grandson, William Gray Staples. Horace decided the fortune he intended to leave his daughter should benefit all young people in town. Nearly 80 years old — and so hard of hearing he carried a yard-long ear trumpet — Horace Staples embarked on a final project that, more than a century later, dwarfs every other endeavor of his long, successful life. He was no stranger to education. In his 20s, he had worked as a schoolteacher. In 1781 his grandfather’s cousin, Samuel Staples, established the Staples Free School in Easton (it is now the Samuel Staples School). In 1882 Horace redrew his will, directing some of his money toward construction of a building. He began planning a red brick building just up the road from his West (now Riverside) Avenue colonial home (it still stands, near Da Pietro restaurant). The school would be on the “horse railroad” line, between the population centers of Westport and Saugatuck. Students could ride the horse cars for three cents a ride (the regular fare was eight cents). Though over 80 years old he was in good health, and came from a long line of long-living people. “I might as well see my name in bricks while I am still alive,” he said. After the building was constructed, Staples’ bequest said, the balance of the funds would be invested in “a perpetual fund” to ensure continued education for both sexes. A ceremony was held on April 22, 1884. At 1 p.m. whistles and sirens blew, church bells rang. Businesses closed. Westporters of all ages poured across the bridge. A procession formed in front of National Hall (where Horace Staples’ owned his bank), turned left and made the short walk to the ceremony, where 2,500 people gathered. Westporters today know it as the site of Saugatuck Elementary School. That’s not the original building, though — it was torn down in 1967. Gov. Thomas Waller arrived. Pastors offered prayers. A choir sang a hymn composed specially for the occasion, by Agnes Lewis. Then came the highlight: the laying of the cornerstone. The Rev. Alonzo Lewis — assisted by “a colored workman” from Easton — spread cement. More prayers were said. Horace Staples’ great-grandson, Master Horace Staples — was introduced. Lewis expressed hope that he would be present at the 100th anniversary of the institution and thunderous applause followed. Staples High School has done much in the 135 years since. It all began — high property values, onions and all — with the foresight, wisdom and funding of founder Horace Staples. Happy 218th birthday, sir.